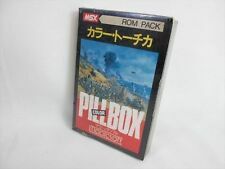 The game "A Life M36 Planet: Mother Brain has been aliving" was developed by Pixel and was released for the MSX system in 1987. It's an action-adventure game where the player has to find out if the planet M36 is suitable for a human colony. While the game was obviously inspired by Metroid, it does deepen its formula with a lot more RPG elements added on top of it. The game has recently translated to English. 30 years after the release of the original game, the game is finally available in English. Thanks to the efforts of Dustin "Hubz" Hubbard (romhacking), Wyrdwad (translation, beta testing) and MP83 (project management, beta testing, trailer). Special thanks to Manuel Pazos for his password generator, which helped greatly with the beta testing process, as well as his bug fixes. More information on this project on our forum. I always thought this game was really worthy, although I didn't play it too much because of the language. Awesome! This game always seemed super cool, but I couldn't get into it due to the language barrier. Added to my play queue!